This folded screen presents a then-and-now view of Mexico City. On this side, the city is in the throes of the fiery wars of conquest in 1520-21. On the other is the peaceful 17th-century city, with the Viceregal palace at its center. The painter depicted the same space of Mexico City on both sides of the biombo. On this side, the notable events of the conquest unfold. 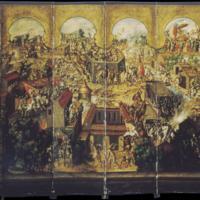 The conquest narrative begins at the upper right, as Hernán Cortés is welcomed into Tenochtitlan by the emperor Moteuczoma. Behind his palanquin is an even grander one, presumably to seat Cortés. Along the central axis is the main plaza where fierce fighting took place for control of the city. Beneath is a scene showing the assassination of Moteuczoma. The painter makes clear that it was angry Aztecs, not Spaniards, who were responsible. At one point during the war, the Spanish were routed from the city. The dark lower right corner obscures their flight, the low point of Spanish fortunes in the war. The biombo is comprised of 10 panels, painted on both sides. When stretched to its fullest, as seen here, it measures 213 x 550 cm (ca. 7 x 18 feet). Today this biombo is in the Museo Franz Mayer, in Mexico City. While its original setting is not known, the biombo most likely adorned a large room in a wealthy urban home in Mexico City. When unfolded to reveal its two distinct views of the city, the biombo may well have become a conversation piece—stimulating talk of the city and its past. The biombo offers one picture of how elites in New Spain understood the wars of Conquest, and their interpretation of these events. Instead of a foreign usurper, Hernán Cortés is shown as a welcomed savior. And Aztecs, not Spaniards, are shown as responsible for the assassination of Moteuczoma, an act which brought autonomous indigenous rule to an end. Florescano, Enrique. 2002. Memoria mexicana, 3rd ed. México: Fondo de Cultura Económica. Florescano, Enrique. 1994. Memory, myth, and time in Mexico: From the Aztecs to Independence. A. G. Bork and K. R. Bork, trans. Austin : University of Texas Press. Mundy, Barbara. 2011. "Moteuczoma Reborn: Biombo Paintings and Collective Memory in Colonial Mexico." Winterthur Portfolio 45 (2/3): 161-176. Schreffler, Michael. 2007. Art of Allegiance: Visual Culture and Imperial Power in Baroque New Spain. University Park, Pennsylvania: Pennsylvania State University Press. Viento detenido: mitologías e historias en el arte del biombo; colección de biombos de los siglos XVII al XIX de Museo Soumaya. 1999. Mexico City: Museo Soumaya.